NEW YORK, Oct. 10 /CSRwire/ - Zerofootprint Inc., a leader in energy information for the public, announced today that Oxford Properties Group has selected its VELO™ platform to help make their energy efficiency programs more successful; by engaging tenants. Real-time energy usage displays on big screens in Oxford’s Royal Bank Plaza lobby, show how the building’s 7500 occupants consume energy throughout the day, bringing awareness to their impact. Zerofootprint’s VELObill“App for Energy” honored at White House Energy Datapalooza. Last week, U.S. Secretary of Energy Steven Chu honored the WINNERS of the Department of Energy’s inaugural “Apps for Energy” challenge at the Energy Datapalooza, including Zerofootprint’s VELObill™. It won the Grand Prize Popular Choice Award in the Green Button “Apps for Energy” Competition. 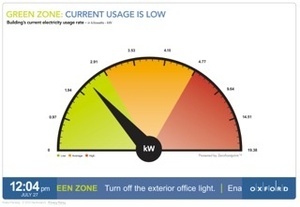 VELObill makes it easier than ever to visualize energy usage data, compare it to peers, and make a plan to save energy. Zerofootprint has been working with U.S. Government agencies such as the Department of Energy to harness the power of Green Button data to help Americans understand and reduce their utility bills. This commitment to U.S. clean energy continues with the Energy Data Initiative, making solutions available to integrate data from Energy Star, utilities, and private sector vendors that help Americans better understand and reduce their energy consumption. Solutions include Zerofootprint’s “Negawatt” and “Improve Your Move” solutions built on its award-winning VELO platform. If your organization is moving people toward energy efficiency, find out more about Zerofootprint’s winning consumer engagement programs at info@zerofootprint.net. Zerofootprint shows energy in ways that help people understand it—and once that light goes on for people, they start to think about turning one off. With VELO™, Zerofootprint enables companies to create more effective energy programs, and has helped hundreds of companies around the world. For more information visit http://www.zerofootprint.net.